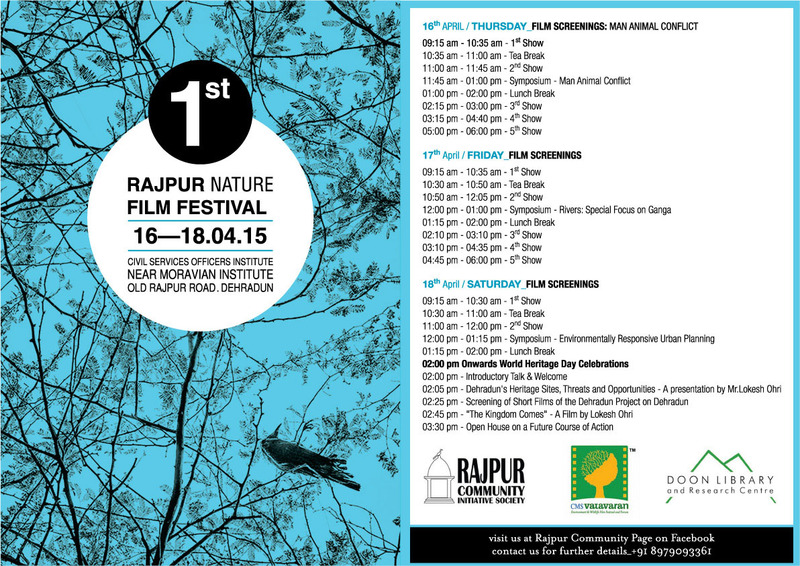 The first Rajpur Nature Film Festival aims to celebrate the natural biodiversity of Dehradun and throw light on the significance and vulnerability of Rajpur as one of the last remaining green belts of the city. The Festival hopes to create awareness among citizens of Dehradun on the need to prioritize environmental concerns along with intelligent urban planning, and explore options that encourage living in harmony with Nature. 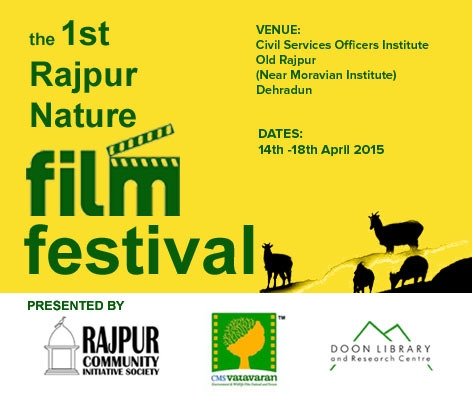 The Festival will be on from the 14thto 18th of April 2015 in old Rajpur, Dehradun. Mini screenings will also take place at two local schools Shahenshai Inter College and The Tibetan Homes School. 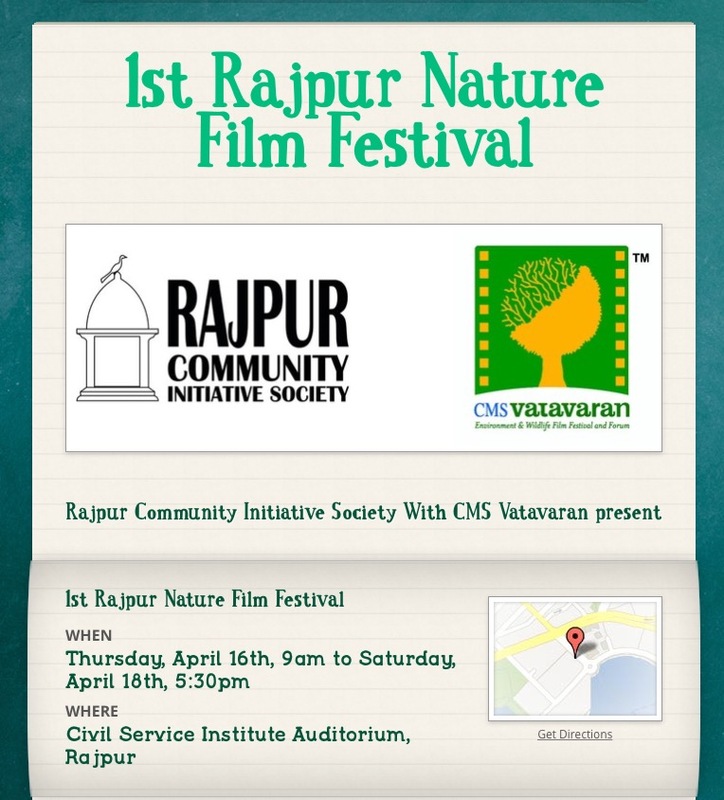 The first Rajpur Nature Film Festival is being promoted by the Rajpur Community Initiative, a local Community led organization in partnership with CMS VATAVARAN, the International Environment and Wildlife Film Festival and Forum. Despite deriving its historical roots from settlements that first came about due to the abundant greenery in the foothills of the Himalayas, Dehradun has transformed into an aspiring metropolis with little regard given to the city’s natural heritage in the face of booming urban expansion. With the population expanding four-fold at least since 2000, the city infrastructure is in shambles with now common traffic jams, inadequate waste management, ill conceived public works etc. There are very few areas left in the Dehradun valley which continue to be a home to abundant natural treasures, scenic forests and wildlife corridors – a treasure that needs to be conserved for future citizens of Dehradun. One such region is the area of Rajpur. Even today, environmentally speaking, the settlement of Rajpur is significant to the city of Dehradun because of the expanse of forests and green belt in the area. The Rajpur forests serve as the origin and natural aquifer of two important rivers that supply 90% of the water for Dehradun, the Rispana and the Bindal which themselves are fast drying up downstream in the Dehradun city due to rampant encroachment for illegal house and shanty constructions. The delicate balance between Nature and human habitation has been disturbed leading to problems such as drying up of natural water reservoirs, increasing temperatures and pressures on already marginalized populations to earn a livelihood. The purpose of the Festival is to celebrate the natural biodiversity of Rajpur, create awareness among the Dehradun citizens and visitors on the need to conserve the unique natural resources before it vanishes. We hope that through the festival dialogues will be generated to throw light on the significance and vulnerability of the natural resources of Rajpur, and focus on the need to prioritize environmental concerns along with intelligent urban planning; and explore ideas that encourage living in harmony with Nature.